ETA II: To add pattern details about the Rib Warmer. Unlike Norma, my all-white meal wasn't so on purpose. I'm really pretty awful at the meal planning most of the time and all I knew at the outset was that I would make scalloped potatoes and ham. Yeah, well, so that's pretty much all I focused on and it wasn't until I was placing it on the table that I realized I didn't make anything else! I quickly warmed up some frozen green beans for hubby and the girls, but I'd spotted the neighboring cauliflower in the freezer and that's what I had! A white meal to go with our white day -- it snowed, at varying rates, almost all day. I have another FOO7 -- Elizabeth Zimmermann's Rib Warmer (pattern found in Knitting Workshop and also, I believe, in an available Spun Out) was completed on Saturday night. It's an amazing -- and amazlingly simple -- thing to knit. Yeah, amaz-ling-ly. 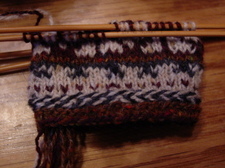 I started a Latvian mitten swatch; not sure how far I'll go with it. My knitting with colors has definitely improved since the last time I tried this at home. I flubbed up on the braid -- not sure what happened, but it's not quite right on the left half of that photo; you see where it changes in the middle from "arrows" to just purl bumps. 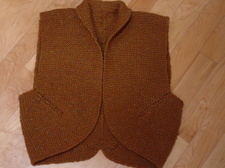 I'll be using different yarn for the real thing -- a tiny bit heavier, less tweedy, smoother, still undecided. I have enough Baby Ull, but I'm not sure of the colors on-hand. Also, yesterday, I knit the collar on Coup d'Etat; the sewing up comes next. Happy Anniversary! You and Rusty are the cutest! I was thinking and talking about you this weekend - my grandmother gave me her buttons! YAY! I just have to go through them all now. Should be completely fantastic. AND she gave them to me in a big coffee can. THE ONLY way, no? Ooooh, happy anniversary! And I love scalloped potatoes. I couldn't agree more about making a white sauce - I premeasure everything so it's all ready to dump in when I need it. I learned to make a white sauce nearly 30 years ago - my mom thought it was essential that I learn this at a very young age. Happy Anniversary!! Ours is on Thursday! Love your rib warmer! I made a couple a few years ago and had so much fun making and wearing them. Did I miss a rib warmer post? Where is that pattern from? I love it. Yum for white sauce. Congratulations on your anniversary! There's the cuteness I know and LOVE! KISS! Love the Rib Warmer and wonder where the pattern is located. I will Google it first and hope for the best! I am on a garter stitch kick at the moment! Happy Anniversary! I like cauliflower but my husband can't stand it. He says it tastes like nothing, which I find interesting... In any case, you rib warmer looks rib warmingly good. It makes me feel cozy just looking at it! EZ would be proud. Happy A! Hit 25 in December ourselves - I just don't feel old enough to have been married that long - but he is, lol. Have you tried mashed cauliflower??? Yummm, with just a scrape or two for whole nutmeg, a little cream to moisten, and of course, butter. 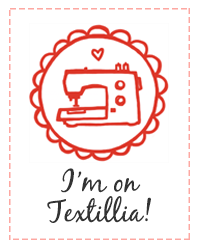 Thanks for the link to the pattern book. I went to Schoolhouse Press and ordered the pattern for $1.00 - while there I ordered a few other pamphlets of EZ's patterns. I like Sally Melville's patterns, and some of hers are very much along the line of EZ's patterns. Thanks, Vicki, I really appreciate this. I will let you know when I knit my Rib Warmer! I agree with Cara, you two are too cute! Many congratulations on your longevity as a couple. And I hope you're just as stunned when you find you've been together for fifty years. Regarding prep for cooking, Mr. Celia insisted we buy eight little metal bowls for ingredients, which he faithfully uses much more often than I do. He's much better at lots of dishes than I am. And cauliflower? YUM! We're having some tonight. Also, I may have to copy you and make the ribwarmer. I've got the perfect yarn for it, and I'm sending away for the EZ book NOW (it also has the Baby Surprise Jacket, which I would like to make for the impending nephew). Happy 25th! And what a darling photo...Love the Rib Warmer - it's on my list for some day...when all the mandatory knitting is completed! Happy Anniversary, you do look very cute. Your Rib warmer looks great. Congratulations! 22 years is pretty amazing in this day and age. Your rib warmer looks very warm and snuggly. Great winter project especially with all the new snow you've gotten! Many blessings and congratulations to you on your anniversary! Wasn’t the snow great? The rib warmer looks fantastic. That rib warmer is truly wonderful. I have some yarn that I purchased at Knitting Camp years ago, just for the ribwarmer. I will have to get it out. Congrats on 22 years together. 22 is a very nice symetrical number! You are only 20 years ahead of me 8-) Nathan and I didn't really do a date - dating isn't big out here. We just hung out together.